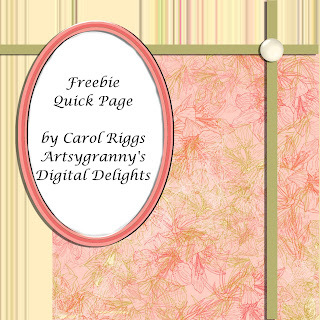 What better way to start off a new week than with a freebie for you? This was one of the very first Quick Pages I made. It's a simple layout, but I'm sure you can find a way to dress it up and make it your own. I hope you like it. Password is orange, simply because I couldn't think of anything else at the time...LOL. Have a great evening! Hug your loved ones and hold them close. Very nice! Thanks very much! Thank you! Your blog post will be advertised on the DigiFree Digital Scrapbooking Freebie search engine today (look for timestamp: 14 Jul [LA 02:21am, NY 04:21am, UK 09:21am, OZ 07:21pm]). Love the colors in this page Carol...thanks! Very nice - you are so sweet to share this! The colors are gorgeous, thank you very much!